It seems to me that the theme of this year’s tour has got to be the kindness and generosity of the strangers we meet. While the original schedule has hit a few bumps in the road, what with the flooding and the damage to the locks, the people we’ve met so far have more than made up for the misfortune. I very much believe that this boat brings out the very best in people, and in a world where all we hear about are negatives, this boat is one of the greatest positives. Coming in to Troy, NY as an unscheduled event has really demonstrated to me how good people are. 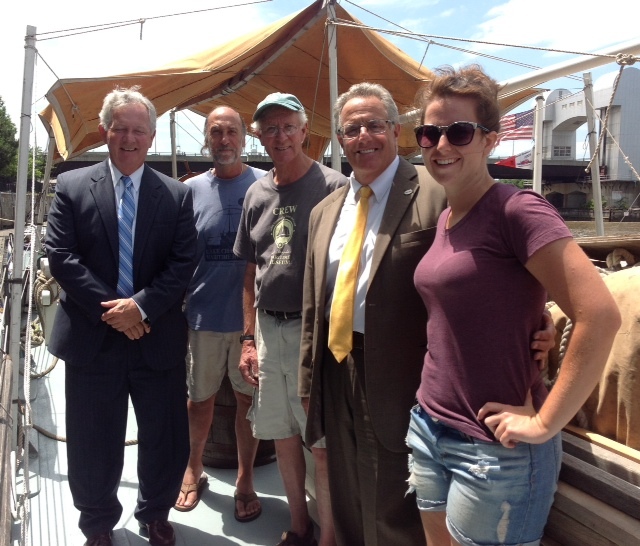 Upon our arrival on Thursday, July 11, we were greeted by a reception of our hosts at the Troy Downtown Marina, some press and the Mayor himself as well as the Deputy Mayor. The Mayor gave us the official welcome to the city, and soon afterwards we were invited by the city clerk, Karla Guererri, to attend the City Council meeting as part of the ‘good news’ section of the meeting. Art and I did later attend the meeting and we were met with genuine smiles and enthusiasm by the council members. They each wished us well on our visit and were quick to offer any assistance in advertising our stop, as well as any other needs we might need met. We soon took full advantage of their offer, and between Lucy Larner, Secretary to the Troy City Council, Karla Guererri, City Clerk, and Lynne Kopka, Council President, they were able to arrange for us use of facilities in the city building, as well as procuring showers in the homes of some good samaritans. We were offered showers by five different couples, the Chupkas, the Sonolis, the Mullers, the Grahams, and P. Miyamoto and S. Bates, each of whom were incredibly hospitable and welcoming of us ‘dirty sailors’ into their beautiful homes. The acts of spontaneous generosity did not end there, however. On Friday evening during our public hours, a very kind couple presented Captain Roger with a bag of corn for the crew. We all shook our heads with wonder at how people with such big hearts always seem drawn to us. Furthermore, our RiverSpark Heritage connection, Michael Barrett, was a key proponent in alerting the press to our unscheduled visit, and our excellent reception at our arrival was likely due in large to him. Barrett also had sent us a reporter from the Troy Record earlier in the week to write an excellent story on our behalf. 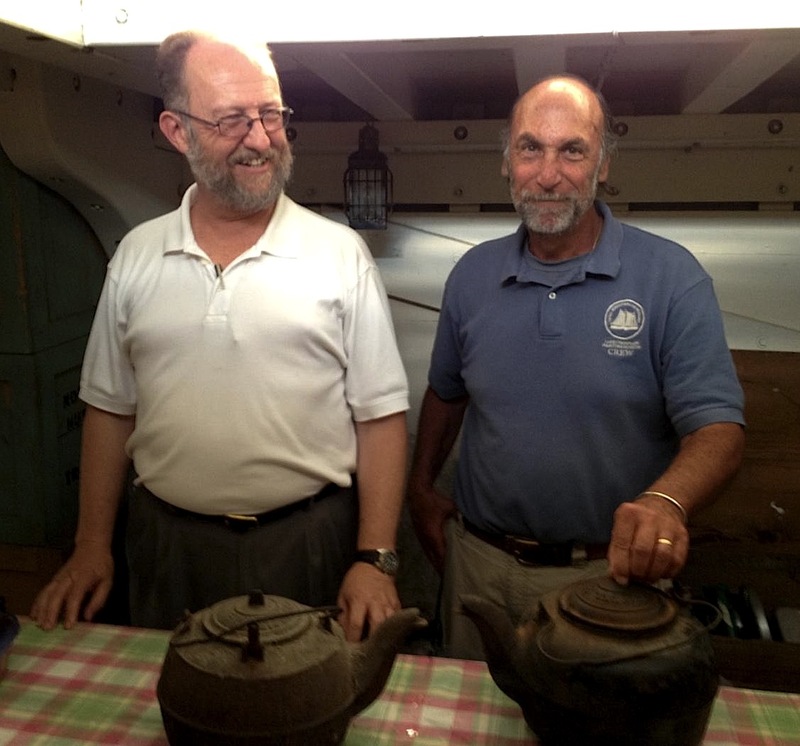 Not only did Barrett alert the press to our visit, but decided to donate, from his own personal collection, an iron kettle made from Foxell & Jones, Troy, NY. Along with the city of Troy and its residents, the Troy Downtown Marina has been beyond hospitable of our stay. Almost completely destroyed by Hurricane Irene in 2011, the Marina has been transferred to new management. The dockmasters, Eric and Kevin, have been working tirelessly to arrange a safe and comfortable stop for the Lois McClure. They have been most generous in welcoming us to their dock and ensuring our every need is met, including driving Kerry back to Waterford to pick up our van. The hospitality continued with Karla Guererri offering us a room in her house. Air conditioning, a shower, and wireless? Heaven! Acts of kindness like this are what make our travels so special. While the newspapers are often highlighting the terrors of the world, we get to see the joys first hand. Hailing from Montreal, Carolyn returns for her second tour aboard the Lois McClure. She is headed to Texas A&M in the fall to begin her PhD in Nautical Archaeology.